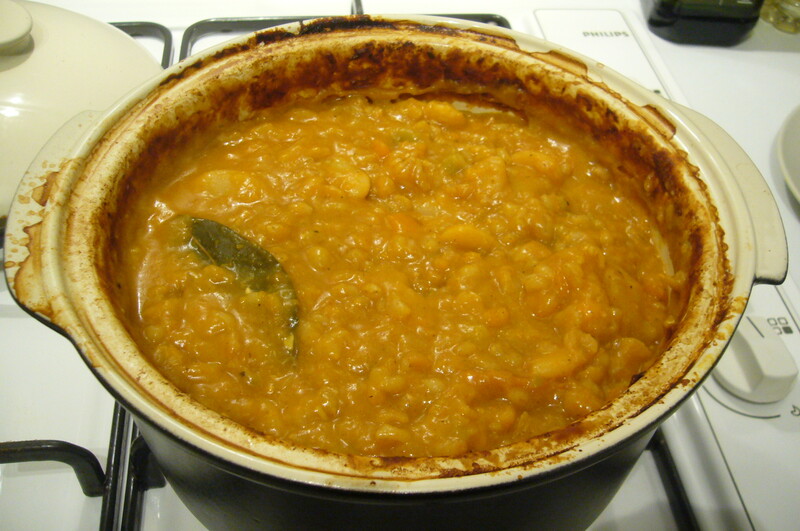 Cholent is wonderfully hearty and reminds me of my grandma. Traditionally, it is a Sabbath stew, made by Jewish women and brought to the village baker’s oven on Fridays. There it would sit for 24 hours, slowly bubbling away, developing comforting and delicious flavours, until the men brought it home for lunch after prayers on Saturday afternoon. The following recipe is adapted from one my mother gave me, which was a mix from an old Jewish cookbook and how she remembered her mother-in-law used to make it. It is traditionally made with beef, but here’s my veggie version. I guess every Jewish household makes it differently, but to me, it’s not cholent without butter beans. Soak the butter beans and the lentils in a generous amount of water overnight. Sauté the onions, then add garlic and carrots. Sauté for a further few minutes until light brown in colour. Add these vegetables to a casserole dish, along with the drained butter beans and lentils. Add all other ingredients to the dish. Pour over boiling water to cover and stir to mix everything well. Replace the casserole lid and place in a 200° oven for 30 minutes or until the contents start to bubble. Turn the heat down to 130° and leave for at least 5 hours (the longer, the better). Periodically check on the cholent – you may need to add more water and stir every hour or so if it’s looking a little dry. Yum yum! This will certainly leave you feeling very warm and happy inside. The next time I made this, I added some soya chunks – they added a good ‘meaty’ texture. Much recommended!